Listen Closely | Tennessee Aircraft Services, Inc.
We find all sorts of odd things when performing routine inspections and not much surprises us anymore. Everything from poor workmanship to missing compliance with an airworthiness directive that can be attributed to human error is just a part of being human. Like pilots or any other profession, we can train and study, but errors are sometimes made. On rare occasion, we come across an illegal field redesign of an original system performed intentionally as a repair. While we can’t imagine any malicious intent, the fact that someone would take it upon themselves to redesign some portion of the aircraft should be of serious concern. I always wonder if the owner of the aircraft was told about the redesign. Most small aircraft electrical systems are very basic direct current systems. A typical circuit would include the circuit breaker, wire to a switch, the switch, wire to a light, the light socket, the lamp, and finally the wire to ground for the return path, all of these connected in series. A very complicated system might add more switches, lights, an electric motor and be connected in series and parallel. Still not overly complicated but often problematic for many when it comes to troubleshooting. One of the most misunderstood electrical systems in the Cessna piston fleet is the preselect flap actuating system. It starts at a circuit breaker, then through wiring and connections through two switches to get to the flap motor. The return path is via two other switches and various wires and connections back to ground. What seems to complicate the circuit is that two of the switches move as the flap changes position and are activated by a cam attached to the flap select lever. These four switches serve to change the direction of current flow through the electric motor as well as to start and stop the current flow. Troubleshooting the many possible problems this system typically experiences requires some thought and a very good understanding of what happens and when. The two switches at the selector handle move anytime the flaps move, which then tug and push on the wire connections at the switches. All this repetitive movement can workharden and eventually break the terminal ends, fray the wires or loosen the connections at the switches. The switches are mounted with very small screws on a plate with slotted holes for adjustment. The constant tugging on the wires can change the position of the switches over time. The function of the two switches at the select lever is specifically to start and stop flap travel at all the intermediate positions, never at the full up or full down position. The full up or down limit switches are mounted at the flap motor/transmission. These full travel limit switches are mounted in such a way that the flap actuator contacts them at the end of its travel. These limit switches also have some adjustment for proper flap position. There are many possible operational failure modes with just as many failure points ranging from switch adjustments, failed switches, failed circuit breaker, bad motor, loose contacts, frayed wires, broken wires and broken terminal ends. These are just the electrical related possibilities, as we’ve not even considered any mechanical issues. As you can see, what starts out as a few switches and a motor quickly turn into a troubleshooting ordeal. The subject airplane is a 210N that came to us after another shop disassembled the plane and started a major repair project but couldn’t complete it. We retrieved the plane and brought it to our shop on our truck and trailer. After completing the structural work, we began reinstalling the major components: wings, tail feathers, engine, etc. While reconnecting the the wiring in the left wing, we found several of the flap wires had been cut and tied away at the flap limit switches. We also noted a couple of new splices near the motor. After some wire tracing, we realized that the two limit switches at the flap motor/transmission had been completely bypassed. This put the full burden of the flap operation on the two micro switches mounted at the flap preselect handle. The flaps appeared to operate normally, except that they didn’t consistently stop at the same full up or down position with each operation. This was caused in part by the slack in the return cable that connects the flap position to the switch plate at the flap position preselect lever. The normal wear in this flap system causes a relative position delay between the beginning of the flap movement when the cable finally moves the preselect switches. There is a similar delay from when a preselect opens the circuit to stop the motor and when the flaps actually stop moving. These delays could cause the flap to contact the end of the flap rails while power is still applied to the motor. As the motor continues to run, the cable tensions increase well past limits until the stress finally mechanically stops the motor’s movement. When an electric motor is not turning, it presents a near zero resistance path for current and, in turn, trips the circuit breaker. Over time, this redesign damages the motor and significantly stresses the entire mechanical system. 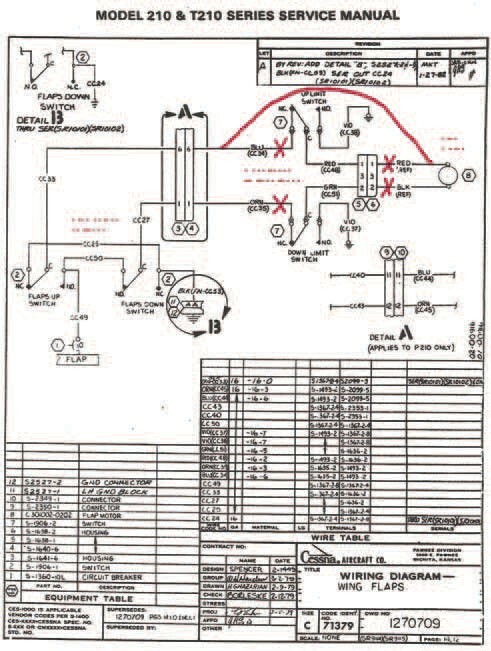 This original Cessna wiring diagram has been modified to reflect the changes made to the airplane. As you can see, the two full travel limit switches are no longer connected to the electrical control of the flaps. CFR Part 43AppendixAdefines the scope of what makes up a major alteration. Airframe major alterations. Alterations of the following parts and alterations of the following types, when not listed in the aircraft specifications issued by the FAA, are airframe major alterations:(ix) Hydraulic and electrical actuating system of components. (xii) Changes to the basic design of the fuel, oil, cooling, heating, cabin pressurization, electrical, hydraulic, deicing, or exhaust systems. It should be fairly clear by reading the regulations that redesigning the flap control system is a major alteration. As such, there must be approved data generated for the new design and an FAA Form 337 documenting it. This approved data could be an STC or a field approval. In our case, no 337 or any sort of approved data could be found in the aircraft maintenance records to account for this major alteration. Aircraft mechanics typically prefer to not work on electrical problems. When they do, the troubleshooting methods are often trial and error. There are times when knowing what the most frequent problem has been on other like aircraft will get the mechanic straight to the source. When that doesn’t yield good results, someone that understands what to do with a voltmeter needs to be found. On this particular flap system, we found several of the slide on terminal connectors on the flap limit switches in the wing had been replaced. These slide type connections do have a history for losing their grip and becoming intermittent in contact. The replacement connectors used were poor quality parts, and the wires were improperly crimped in place. It is very possible the mechanics found the original problem and installed new connectors to make the repair. Unfortunately, the inferior parts combined with the improper installation caused the same sort of problem in the system’s operation. At this point, I’m sure the mechanics’ frustration levels had pegged out. The problem had been found and a fix applied, but the flaps still didn’t work correctly. After checking and rechecking all the components, the exasperated mechanics finally gave in. After reading over the schematic, they realized they could bypass the limit switches and get something similar to correct flap operation by just employing the preselect switches. Having fresh eyes on the situation and none of the frustration the previous mechanics experienced, we were able to troubleshoot the problem relatively easy. First, we tested the limit switches and verified they were functioning well and didn’t have any high resistance on their contacts. Second, we replaced all the connections with good quality units and crimped the wires in them with the specified tools. We then removed the splices that modified the system and returned it to its original design per Cessna’s wiring diagram. That’s all it needed, and everything worked to specifications as advertised. When discussing various airplane problems and solutions with your mechanic, listen very closely to what may not be being spoken out loud. We mechanics will let you know when a particular issue was difficult to resolve, I don’t know why we do, but maybe we just like to share the pain a little. When you hear these sorts of comments, listen for any hints that the solution may not be within the manufacturer’s specification. You might hear a phrase in the resolution that implies a work around was used. If you pick up on subtle hints to this effect, dig a little deeper to get a full understanding of what was done Remember, it’s very doubtful some nefarious act was committed, so be careful in your approach. Your best interpersonal skills should be brought to bear on this conversation. As always, you are ultimately responsible for the airworthiness and safety of your plane. Of course, that doesn’t mean you’re expected, or able, to oversee everything that’s done. What it does mean is that you should use all the tools available to ensure satisfactory work is being performed. Sometimes, the best tool for an owner is being a perceptive listener.